Q: Guruji, I have been posted in India to look after a business, however I am not very comfortable living in India. What should I do? Sri Sri Ravi Shankar: Sometimes, we donít like things, but if it is a profession, you may have to do it. Donít go with the mind because the mind sometimes likes and sometimes does not like doing things. If you keep doing your practices, meditation, satsang and service, you can make yourself feel comfortable in any place. We should not have aversion or craving towards anything. That is real Yoga. Q: Guruji, It is said that we should not do any pooja during Rahu kaal. However, why does Sunday’s satsang always happen during Rahu kaal at the ashram? Sri Sri Ravi Shankar: It is not said that we should not do pooja during Rahu kaal. In fact, it is good to do pooja during Rahu kaala. However, marriages and house-warming ceremonies must not be done during this time. It has only been said that one should not do any materialistic work during this time; not that one should not remember God or do satsang. Doing satsang is good during Rahu kaal. It is good to do satsang during an eclipse and during Rahu kaal. To do satsang, all times are auspicious. To help others and to remember God, we need not look for any auspicious time. All the twenty-four hours are good for this. Q: Guruji, I know one cannot be happy and married. But can one be married and enlightened? 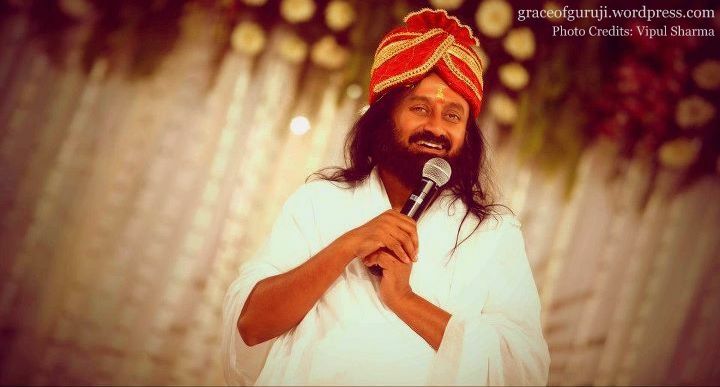 Sri Sri Ravi Shankar: Why do you think that one cannot be happy and married? Why cannot you be happy and married as well? There are many bachelors who are not happy, and also there many married people who are happy. Happiness is an attitude which you chose. It all depends just on you. There are people with no jobs but are happy. There are people with jobs and are unhappy. Be wise and be happy. Do whatever married, unmarried, employed, unemployed, but independent of what you are doing, you need to be happy. Q: When people ask you a question at satsang, do you answer the question for that particular person or for all in general? Sri Sri Ravi Shankar: Both! You are getting your answers, right? Whatever answer I gave you, you got your answer, and it has also given some answer to others who are in a similar situation. Q: Dear Guruji, time is a very important factor in success. It should happen at the right time to be fruitful. Do we have the inner ability to ascertain when the right time for something is? If so, how? Sri Sri Ravi Shankar: Yes. If you want to start any job, first sit quiet and become calm and listen to your inner intuition. Then just start the work. Q: Guruji, 5000 years ago, you chose a chariot as your vehicle. Now, this time you have chosen Innova as your vehicle. Sri Sri Ravi Shankar: I was thinking I am sitting in your heart, but you are making me sit in an Innova. I like to sit on that aasan (seat) which is in everyone’s heart. Q: Guruji, Many people get the clarity in their mind from a young age of their passion to become doctors, engineers, teachers, etc., and they stick to it. Unfortunately I do not feel that way. I am not young anymore and this lack of direction scares me. What can I do? Sri Sri Ravi Shankar: No, don’t worry. Life is all designed. If you don’t have the clarity of what you want to do, then meditate and go by your intuition. I tell you, all professions are the same. People of no profession are happy. Look at doctors they are so miserable, because all their lives they have to be with sick people. For 15 hours a day they have to be with sick people and listen to all their problems, and even if they give them the solution they ask the same questions again. Look at engineers. Working with machines day and night they become like machines. Engineers themselves say it. ‘Oh, it’s so boring. All day and all night, machines, machines and machines.’ Even in their dreams they see machines. Lawyers; can’t even ask them of their plight. They look for some problem to happen somewhere so that they can survive. If everything is peaceful the lawyers have no survival. You take any profession there are flaws in it. Religious people, it is an even bigger problem. There is a nice story in the Ramayan, do you want to hear the story? There was a stray dog that was walking on the street and someone threw a stone at the dog and chased it. So the dog went to court. It is said that in Lord Rama’s court, everyone got justice, even animals. The dog said that the road is for everybody. He said, ‘It doesn’t say anywhere on the road that dogs are not permitted here. I was walking on the road and this man hurt me; you should punish him.’ So Lord Rama asked the person if it was true. The person could not lie, and agreed that he had hurt the dog. In those days, they used to ask the victims on what punishment should be given to the culprit. So when the dog was asked on what punishment should be given to the man who hurt him with the stone, the dog said, ‘Make him the head of a religious institution. Make him a Guru of some Ashram.’ The people said that this is a very strange punishment. The dog said, ‘Why are you asking? Just make him that. I was also a Guru in my past life, see what has happened! Then before dying, I thought that I should have been a stray dog that would have been better than being a Guru. See, that is why I have become a dog now. I had so much trouble. He too should become the head of an Ashram, and then he will experience what is trouble in life, and what is pain, and what is suffering.’ It is a very funny story in the Ramayan. Every job, every profession, every work on this planet is not easy. Every profession is tough. No work is easy. So, do not worry about any profession. All professions are the same. Find some job to make your life livable. You don’t have to become too greedy and you don’t have to feel a sense of lack. We need to feel abundance in our mind, in our heart. Money is something which can never be enough. If you see, even billionaires are also wondering how they can make their money grow by two-folds and three-folds. This race never ends. Do you see what I’m saying? You can find a smile in a small hut, but you might not find a smile in a palace. You might not even find a calm mind in a palace. 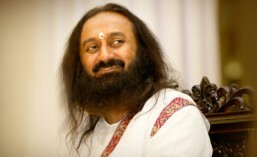 Q: Guruji, My intellect takes time to understand, can you talk little bit about time being spherical. Sri Sri Ravi Shankar: OK. It’s a very difficult topic. Whatever happens in 24 hours time during a day, to recollect and remember how much time do you need? Do you need 24 hours? From the time you woke up till you go to bed. These 18 hours so many things happen. To recollect these you do not need 18 hours. You need may be 18 minutes. Even if you slowly recollect every event 10mins is sufficient. So what is time? Now in memory the 10 min is equal to 18 hours. Similarly when you fall asleep, sometimes your dream appears so short, sometimes you experience that which happened 15 years ago. So vivid and clear and sometimes what will happen in future. Do you see now time linear, like a ball. In a ball outer circumference is like 18 hours. But inner which connects to every outer point is only 10 min. The time you take to go round the 18 hours is same you take to go around the inner circle (10min). In 10 min you got everything. So in the consciousness you go and share experience. Time, mind, world is spherical. That is why there are dimensions in time. So in this lifetime you can have experience of so many life times. When you go through eternity process, what happens? You came to know that which happened some 300 years ago. It is like piercing the ball and going to a spot. A gentleman had pain went through the process and found that in World War II he had fallen from plane. And the pain then disappeared and he became all right. Haven’t you heard about this? There are so many cases. Many psychologists work on this regression theory and heal people, because time is spherical. Right now the memory, the mind are one whole. So here it appears day and time but in moon so many days have passed. In space it is so different. This universe is full of events and in many directions and there are multi-dimensional times. This means it is spherical. The future and the past they all exist in the future. So you can cognize the future now. How do these psychic people (readers, crystal ball gazing) work? But it’s not solid. There is always a possibility of change also. The change of the event is possible now. Do you see what I am saying? See, in a bowl of glass there is a fish and you can predict that the fish will move within the boundaries of the bowl. But it can go in any direction and you cannot predict that. It has this freedom but it has not freedom to come out of the bowl. Similarly in time freedom is also there, so it can go, generally you can predict. But prediction of future cannot be 100%. The more centred you are, you have 50 to 70% freedom. More dispassionate person has much more freedom. Q: Guruji, You once said that the body is in the mind, and not the other way around. Please explain what you mean by this. Sri Sri Ravi Shankar: I give a very simple example to a layman. When you light a candle and keep it inside a glass, the flame remains only as long as there is oxygen inside the glass. In the same way, if you put a man or a woman in a room and lock them up, they will be alive only as long as there is oxygen in that room. So we are akin to the flame, we live on oxygen. Our consciousness, our life, our mind lives on oxygen, just like a flame. The body is like the wick of a flame, the mind is like the glow all around; though we don’t see the mind. When we take a picture through ‘Kirlian photography’, the aura of a person can be measured; the energy field around a man or woman can be measured. This is what I would say is mind. Mind is nothing but a mass of energy and intelligence. It is the wave function, the wave of vibrations around you. When the body is relaxed, the mind expands. This is our feeling generally. When you are happy, what is the feeling you get? You feel that something in you is expanding, isnít it? And when you are upset, you find that something in you is shrinking; the energy in you shrinks and that is when you feel uncomfortable. When the energy expands, you feel happy, elevated and comfortable. And this particular phenomenon indicates that our body is inside the mind, and not the other way around. Again through medical science, there is other evidence. Have you heard about Phantom Limbs? When somebody’s arm has been amputated, still they feel itching and pain in that area where there is no arm, and they find it even bigger than the arm. This also indicates that our body is inside the glow called the mind. Q: Guruji, I get completely exhausted when I meet a lot of people in my day, but when I see you working round the clock meeting thousands of people every day, you don’t seem to be tired. What is the secret? Sri Sri Ravi Shankar: I have put all my secrets together as the Art of living Part 1 course, Part 2 course, Ashtavakra Gita and everything else. Click Here to subscribe to Grace Of Guruji’s Newsletter!